As most of you should know, I'm a pretty big fan of Leonardo DiCaprio. My obsession started with him when I was 13 years old, and saw What's Eating Gilbert Grape for the first time. His performance in that is something fantastic - at age 19, he plays a young boy who is mentally retarded, and makes his brother's (Johnny Depp) life quite difficult with his hyperactive actions. I cried foul when I found out that he didn't win an Oscar for that performance. Until I saw Ralph Fiennes in Schindler's List. How the hell did both of them miss out on an Oscar that year? But I guess mine and Leo's story begins back at the beginning of 2007, when I was 11 years old. Titanic was on TV, and my mother had recorded it so she could watch it again later. Usually, I didn't watch movies with her, but I managed to catch the tail end of it, basically from where one of the lifeboats is going through all of the dead bodies. For some reason, I was ready to declare this movie as my favourite movie of all-time, and Leo and Kate were suddenly my favourite actors. Alas, it was another two and a half years before I saw the movie in it's entirety. While I had grown up a little since 2007 and wasn't ready to throw myself into calling something my 'favourite movie' after five minutes of it, Titanic was still a bloody good, if a little long, piece of cinematic history. By 2009, however, it wasn't really that cool to like Titanic. In fact, I don't know if it ever has been. A certain bout of 'Leo Mania' may not have helped it - but I do admit, I'd be the biggest Leo Maniac of all. So I haven't really been too vocal about really liking Titanic. Because it is so isn't 'cool' if you like one of the highest earning films of all time. Now it is a high earning film which is set to keep earning. When I heard that James Cameron was converting it to 3D, I remember thinking 'Jesus, James, keep it in your pants. You can't be that strapped for cash that you have to go converting all of your old films into 3D just to stay relevant?' To be honest, I don't stand anywhere on the 3D debate. If a film has the option of 2D, I'll see it in 2D. If it is only in 3D, I don't know how I'm supposed to critique the 3D. Last night, me and three friends made the trip to the cinema to see Cameron's big 1997 spectacle on the big screen, with three dimensions. And I was extremely happy that I got to experience that. The 3D didn't really add anything, but it was a lot better than I thought it would be. However, the experience was something special for me because going to see it on the big screen was what I imagine it was like for the crowds in 1997 - except, I had to wear the goofy 3D glasses. The film is perhaps one of the more amazing things I've seen on the big screen, and also, the longest time I've spent in a cinema to date (also the latest I've ever been to the cinema. We didn't get out until 11.15pm). The length of the film is something I've always held against it, but I can't say that there was a moment that I wasn't entertained by good old Jack and Rose and their forbidden romance on board the 'unsinkable' ship. 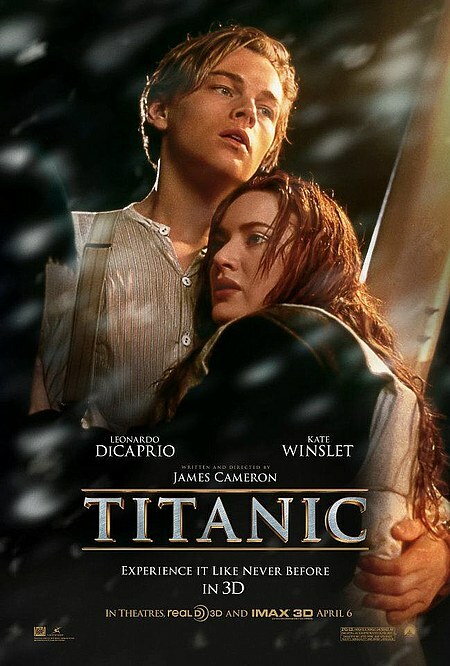 As much as I enjoyed seeing Jack and Rose giving me at least 1000 reasons why Leonardo and Kate should actually get married, I couldn't wait until we got into the sinking part (in a non-sadistic, I-like-seeing-people-suffer kind of way). It is no secret that James spent a crapload of money to make this film, but the way he does it is absolutely stunning. Jack and Rose spent an awful long time getting on and off lifeboats, going down hallways and getting trapped, trying to swim, but the amazing production values ensured that my eyes were glued to the screen. Unless Billy Zane is on screen. He was unsettling, and not in a good way. Whether you like it or not, Titanic is a stunning cinematic achievement. It sky rocketed two of the best actors around at the moment into the spotlight, which they've barely left since then. It became the highest grossing movie of all-time (until James Cameron decided that he'd do even better than that with Avatar). It pushes that everything was available to cinema at the time to it's absolute limit, with amazing results. Titanic is not a perfect film. The story is a little too clichéd in the beginning, and the script is a little dodgy. But what James Cameron achieved with it is something which I love. If I could ever make it that far and achieve those results, I'd be extremely happy with life and probably retire after that. Titanic was described as the 'ship of dreams'. The movie is like the 'movie of dreams', to me. Ever since I caught those five minutes back in 2007, I knew that there was something special about it. I'll probably end up seeing this movie again when I'm in my 30s and pregnant, crying all alone with my ice cream in hand. And I'll remember the day that I saw the film on a huge 3D screen, right on the 100th anniversary of the disaster, and fell in love with Jack and Rose all over again. Sure, I was 15 years late to the party, but I'm glad that I saw such a stellar film on the big screen at least once in my life. Looks like I'll be the bubble burster... hated this movie. Not as godawful as Avatar, mind, but still pretty bad IMO. The only part I liked was when the boat tipped up and all the people fell off it into the water. Hilarious. Other than that it's just an over-the-top Oscar bait snoozefest. Like most Cameron movies. This is the first film I remember seeing. I love it. I don't care if it's cool or not. This film is beautiful and stunning and oh my god, Jack Dawson was my first love. Also this film started my obsession with redheads. I have seen it way too many times, and I still cry. I really wanted to see this in 3D. It's been a year since I last saw it so I am ready to let go again, but it's not showing in the IMAX theatre in my city. Gahhhhhh. Oh, I love Kate's hair in this! :( Oh no! It is actually really cool to see it on the big screen! It is a fascinating story, and I think James did it well! Yeah, I don't care about what people say. I must admit I don't give a damn about too snobby opinions more and more often... 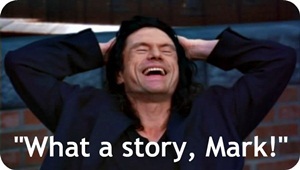 Some folks try to be super-smart bashing a film that earned lots of money and has a romantic story at its core. Those are just two reasons for their hatred. However, Titanic is a quality filmmaking, that's something they've been trying to deny for years. This movie has always been one of my favorites (it's definiteky in my top 100 list) since the first time I saw it as a teenager -- much later since its original release, and I was immensely happy to see it on big screen now. It made me realize that I DO love this film. Even hough I watched it hundreds of times. Amen to that! I hate snobbery - I'm getting SO sick of it! I've only seen it twice, but I do really love it. It is fantastic! Great write up Stevee! I like Titanic, it's one of those movies that has everything in it - great production values, great actors, beautiful score, a lot of emotions and fantastic performances especially from Winslet, she was fantastic here and I think she looked her best in this one. I haven't seen it in 3D and I'm so busy I don't know if I will, but it would be a shame to miss it on big screen again. Thanks! Kate was lovely in this film, she really was. Great perspective Stevee. The one thing I thought was great was it's portrayal of what it was like to be in the ship while it was going down. I held my breath through most of those scenes. Thanks! And you should, it was an awesome experience. I totally agree! I never fell out of love with this film, it's always been firmly in my top 5 of all time. But seeing it on the big screen again was just incredible. The 3D was great in parts, a little dodgy in others but seeing this on the big screen while the Titanic was sailing 100 yrs ago was a truly extra saddening but amazing experience. Great write up! Loved it that it took only those end scenes for you to fall in love with it. Sometimes the 3D looked a bit like a pop-up book, but it was still cool. I remember my first exposure to the film. It was around the time it initially came out, but before I actually saw it. I was on a plane and it was the in-flight movie (or one of them, anyway). I wasn't watching it for some reason. A woman not far from me was, however, and she was crying quite a bit. No shame in that! It's a pretty great film and obviously very emotional. I've seen it a few times since then and I like it quite a bit, as I do all Cameron films (for the most part). I've even considered checking out the 3D re-release. We'll see! Wow, it would have been interesting seeing it on a plane! I probably would have been like that woman! I don't hate it like Tyler does, but I'm not a fan. I know it's a good example of the sort of thing it is (i.e. the great big contemporary FX extravaganza with romance thrown in to try and humanise it a bit), but I don't particularly like what it is. It doesn't seem like your type of film. I've been into the Titanic for years (spookily it was launched on my birthday)and have watched all the various films with different levels of enjoyment but one thing James Cameron does with all his films is bring spectacle to the screen and you can certainly see he was passionate about the subject here. Of course it has it's flaws as most films do, parts of the script spring to mind but I loved it anyway when I saw it on first release. When the 3D came out I knew I had to see it especially as it will probably be the last chance to see this huge film like this on the big screen. The 3D conversion was a bit clunky in a couple of places but was impressive overall, especially the effects showing the length of the ship and engine room scenes both really adding depth . All he needs to do now is put the 29 deleted scenes back in for a truly bum numbing 4 hours plus experience.